As you age, it’s not uncommon to develop excess tissue and excess skin around the eyelids. That excess tissue can begin to make patients look older and more tired than they actually feel. This disconnect can lead many patients to feel compelled to seek out a procedure known as eyelid surgery. Eyelid surgery (blepharoplasty) is a procedure that removes fat along with excess skin and muscle from the upper and lower eyelids. Eyelid surgery can correct drooping upper lids and puffy bags below your eyes – features that make you look older and more tired than you feel, and may even interfere with your vision. It won’t remove crow’s feet or other wrinkles, eliminate dark circles under your eyes, or lift sagging eyebrows. Blepharoplasty can be done alone or in conjunction with other facial surgery procedures such as a facelift or browlift. Blepharoplasty works to improve the overall appearance of the eyes by removing excess tissue from the region. People can look older than they are due to puffy bags under the eyes or drooping, heavy eyelids. Blepharoplasty can help restore a youthful appearance and make the eyes look more alert. If you’re interested in discussing what this procedure can do to improve the appearance of your eyelids and your eyes themselves, contact Dr. Rokhsar to schedule a consultation. How is an Eyelid Lift Accomplished? As blepharoplasty is considered to be a minor procedure, it is generally done under a combination of local anesthesia and IV sedation. Many candidates choose to get eyelid surgery at the same time as other procedures such as a face lift, brow lift, or rhinoplasty. What Do Our New York & Long Island Blepharoplasty Patients Say? While some patients choose to focus only on their upper or lower eyelids, many choose to have the procedure done on all four lids. 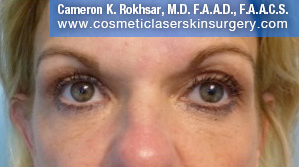 In these cases, surgery is first performed on the upper lids, then the surgeon moves to the lower lids. Incisions are usually made in the crease of your eyelid for the upper lids and slightly underneath your eyelashes for the lower lids. 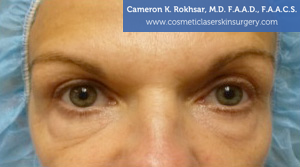 If you want to get started on your eyelid transformation, contact us today!